To arrange multiple ggplot2 graphs on the same page, the standard R functions - par() and layout() - cannot be used. 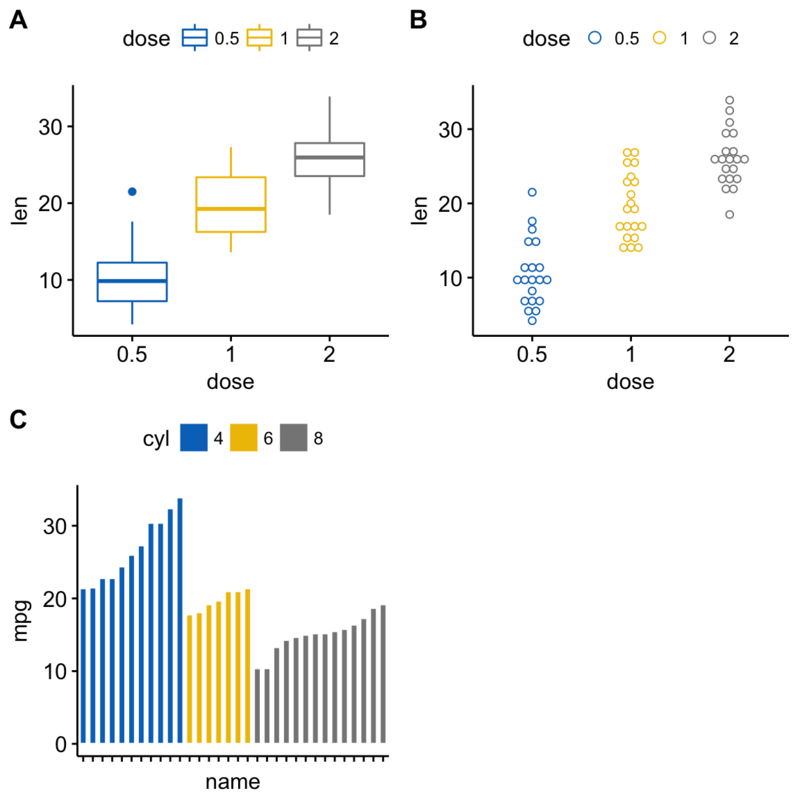 marrangeGrob() for arranging multiple ggplots over multiple pages. However, these functions makes no attempt at aligning the plot panels; instead, the plots are simply placed into the grid as they are, and so the axes are not aligned. If axis alignment is required, you can switch to the cowplot package, which include the function plot_grid() with the argument align. However, the cowplot package doesn’t contain any solution for multi-pages layout. Therefore, we provide the function ggarrange() [in ggpubr], a wrapper around the plot_grid() function, to arrange multiple ggplots over multiple pages. It can also create a common unique legend for multiple plots. 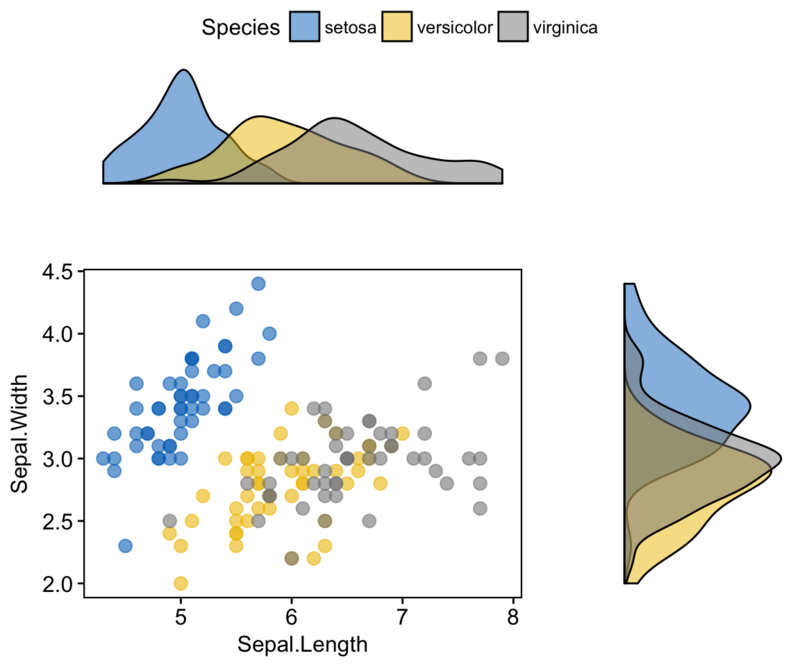 This article will show you, step by step, how to combine multiple ggplots on the same page, as well as, over multiple pages, using helper functions available in the following R package: ggpubr R package, cowplot and gridExtra. We’ll also describe how to export the arranged plots to a file. Note that, the installation of ggpubr will automatically install the gridExtra and the cowplot package; so you don’t need to re-install them. Data: ToothGrowth and mtcars data sets. 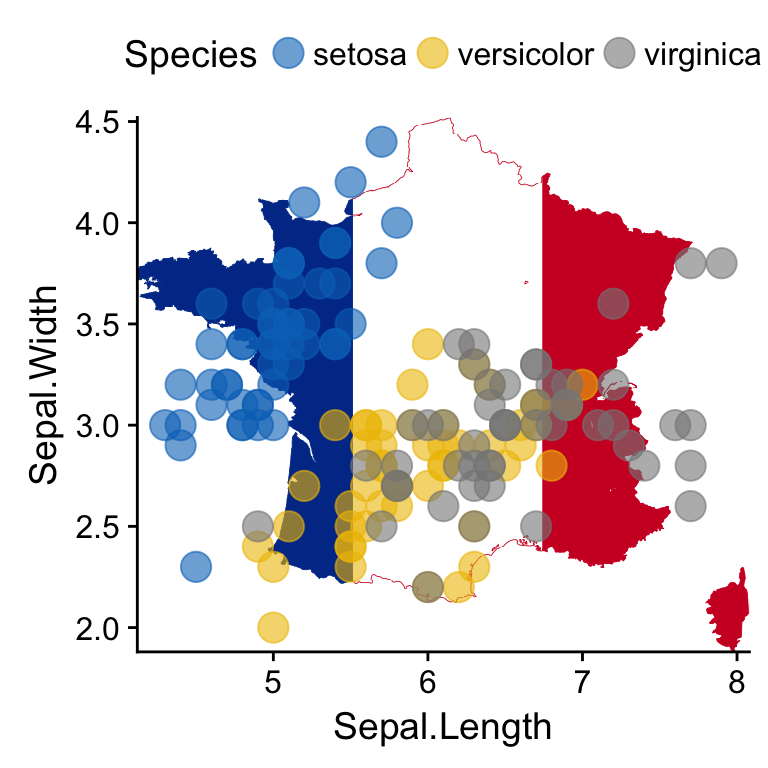 Here, we’ll use ggplot2-based plotting functions available in ggpubr. You can use any ggplot2 functions to create the plots that you want for arranging them later. 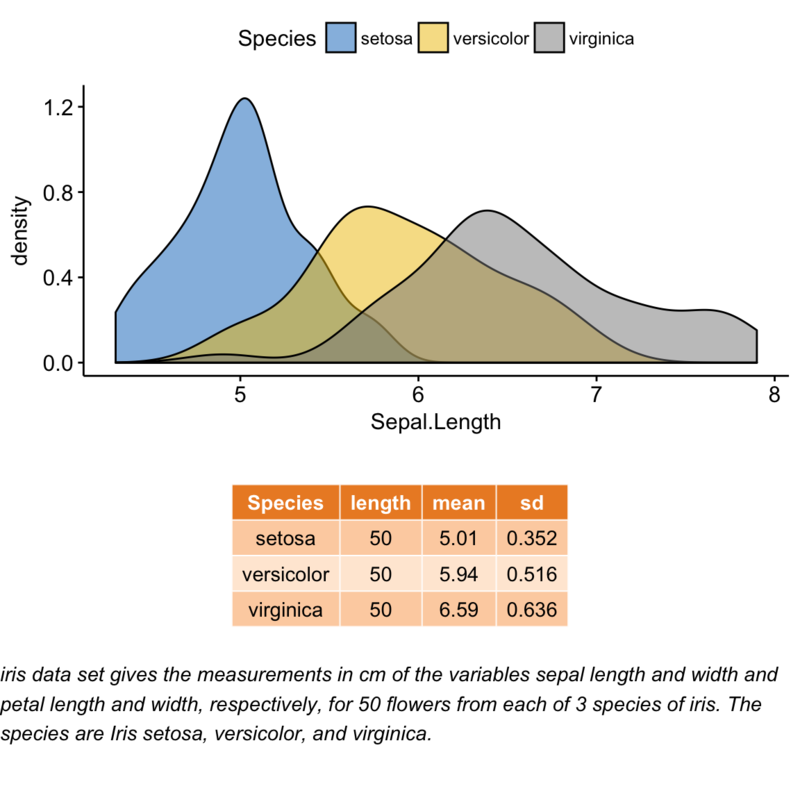 You’ll learn how to combine these plots in the next sections using specific functions. 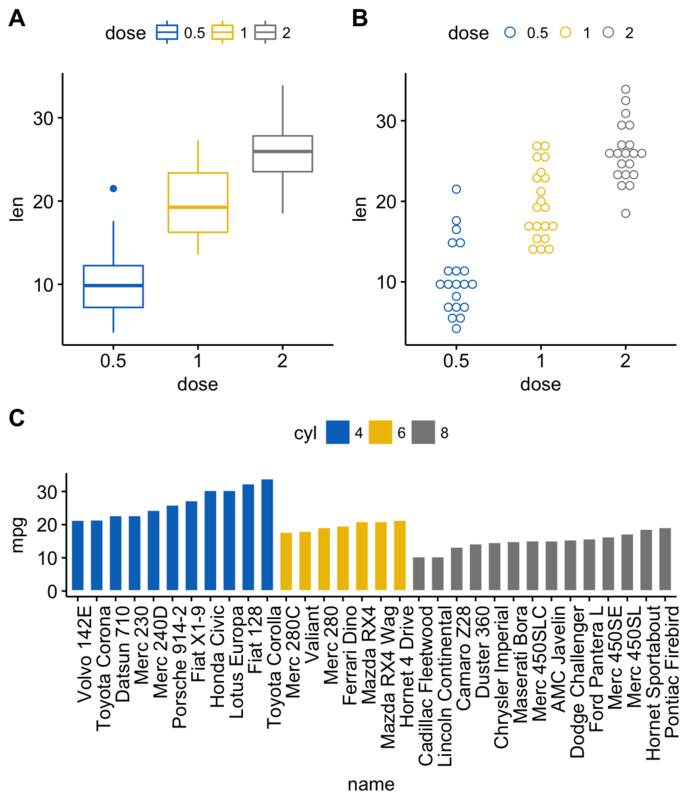 color = "cyl", palette = "jco", # Color by groups "cyl"
shape = "cyl"                   # Change point shape by groups "cyl"
To arrange multiple ggplots on one single page, we’ll use the function ggarrange()[in ggpubr], which is a wrapper around the function plot_grid() [in cowplot package]. Compared to the standard function plot_grid(), ggarange() can arrange multiple ggplots over multiple pages. 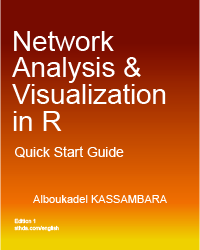 R function: annotate_figure() [in ggpubr]. 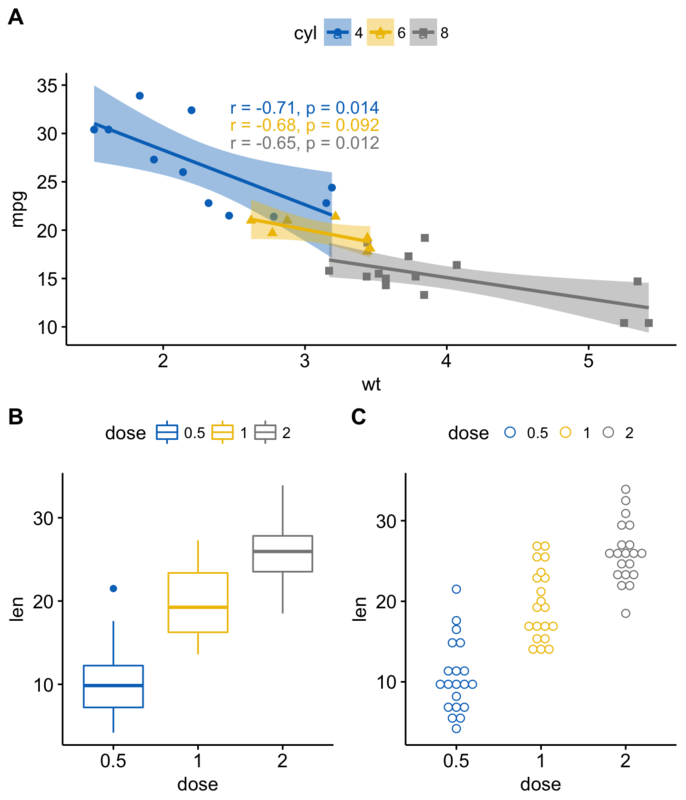 fig.lab = "Figure 1", fig.lab.face = "bold"
Note that, the function annotate_figure() supports any ggplots. 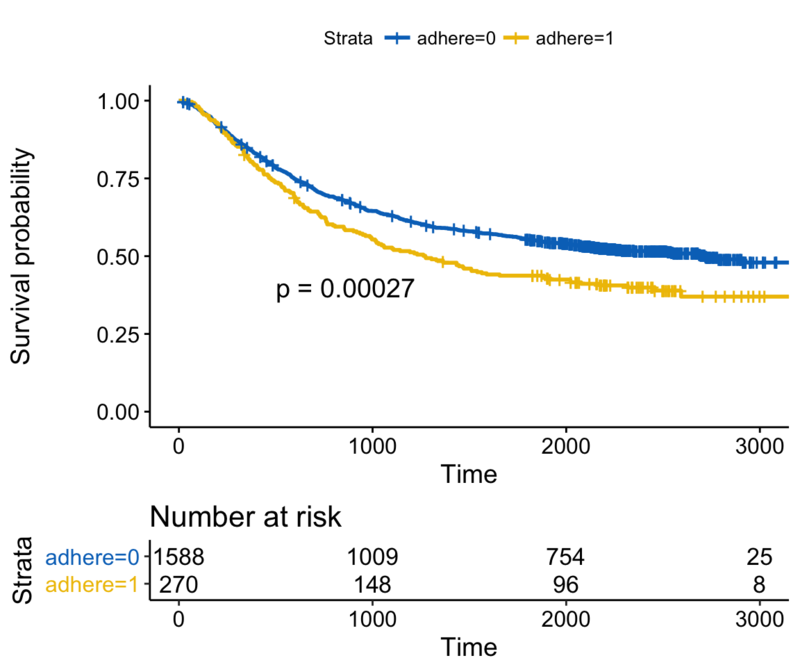 A real use case is, for example, when plotting survival curves with the risk table placed under the main plot. 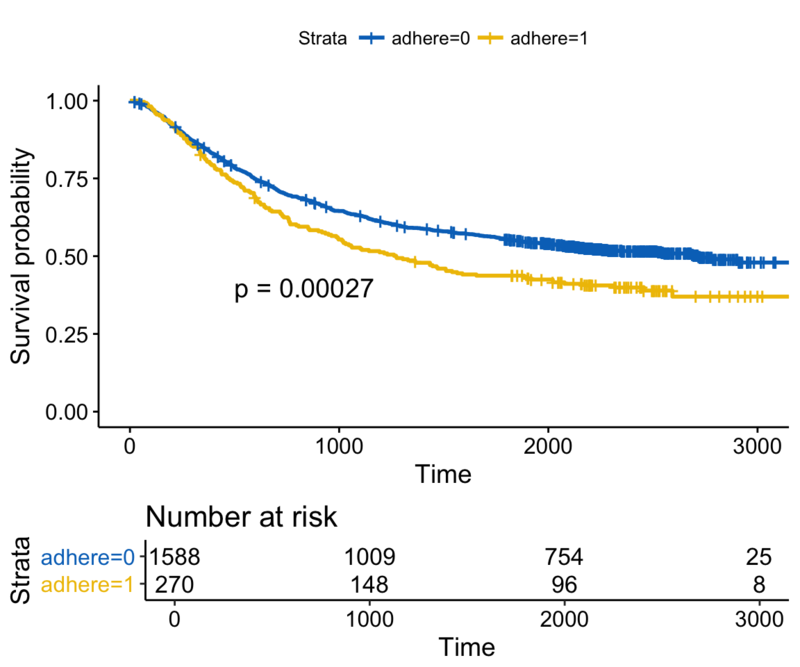 ##  "plot"           "table"          "data.survplot"  "data.survtable"
It can be seen that the axes of the survival plot and the risk table are not aligned vertically. To align them, specify the argument align as follow. 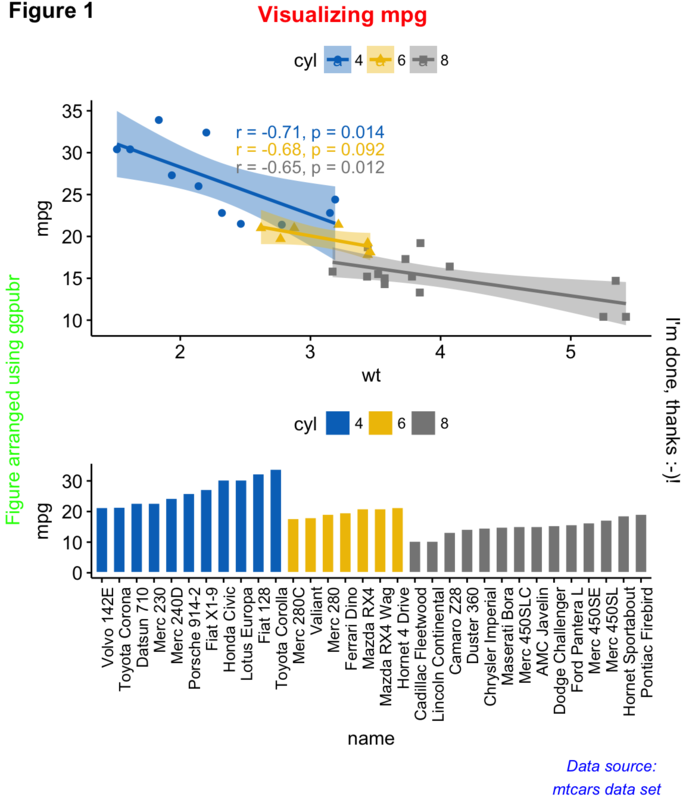 We’ll use nested ggarrange() functions to change column/row span of plots. The combination of the functions ggdraw() + draw_plot() + draw_plot_label() [in cowplot] can be used to place graphs at particular locations with a particular size. Note that, by default, coordinates run from 0 to 1, and the point (0, 0) is in the lower left corner of the canvas (see the figure below). x, y: The x/y location of the lower left corner of the plot. draw_plot_label(). Adds a plot label to the upper left corner of a graph. It can handle vectors of labels with associated coordinates. x, y: Vector containing the x and y position of the labels, respectively. The function arrangeGrop() [in gridExtra] helps to change the row/column span of a plot. It’s also possible to use the argument layout_matrix in the grid.arrange() function, to create a complex layout. In the R code below layout_matrix is a 2x2 matrix (2 columns and 2 rows). The first row is all 1s, that’s where the first plot lives, spanning the two columns; the second row contains plots 2 and 3 each occupying one column. Note that, it’s also possible to annotate the output of the grid.arrange() function using the helper function draw_plot_label() [in cowplot]. To easily annotate the grid.arrange() / arrangeGrob() output (a gtable), you should first transform it to a ggplot using the function as_ggplot() [in ggpubr ]. Next you can annotate it using the function draw_plot_label() [in cowplot]. In the above R code, we used arrangeGrob() instead of grid.arrange(). Note that, the main difference between these two functions is that, grid.arrange() draw automatically the output of the arranged plots. As we want to annotate the arranged plots before drawing it, the function arrangeGrob() is preferred in this case. 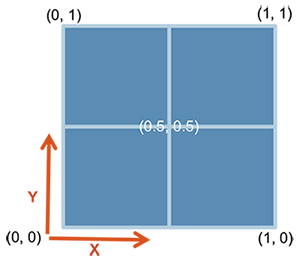 The grid R package can be used to create a complex layout with the help of the function grid.layout(). It provides also the helper function viewport() to define a region or a viewport on the layout. The function print() is used to place plots in a specified region. In this section, we’ll show how to plot a table and text alongside a chart. The iris data set will be used. 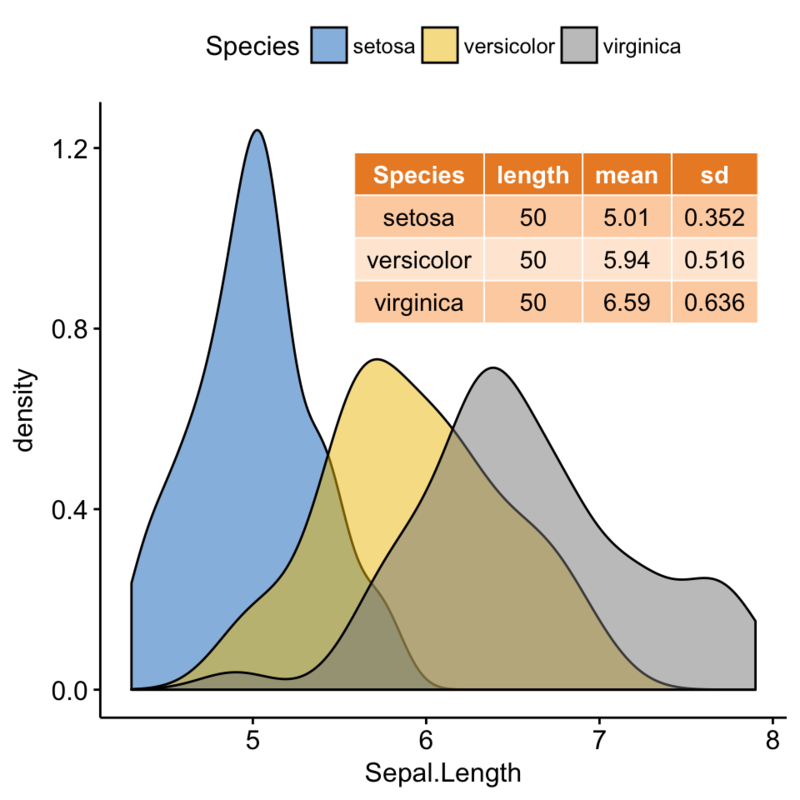 a plot of the summary table containing the descriptive statistics (mean, sd, … ) of Sepal.Length. 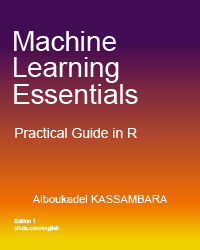 R function for computing descriptive statistics: desc_statby() [in ggpubr]. R function to draw a textual table: ggtexttable() [in ggpubr]. a plot of a text paragraph. R function: ggparagraph() [in ggpubr]. 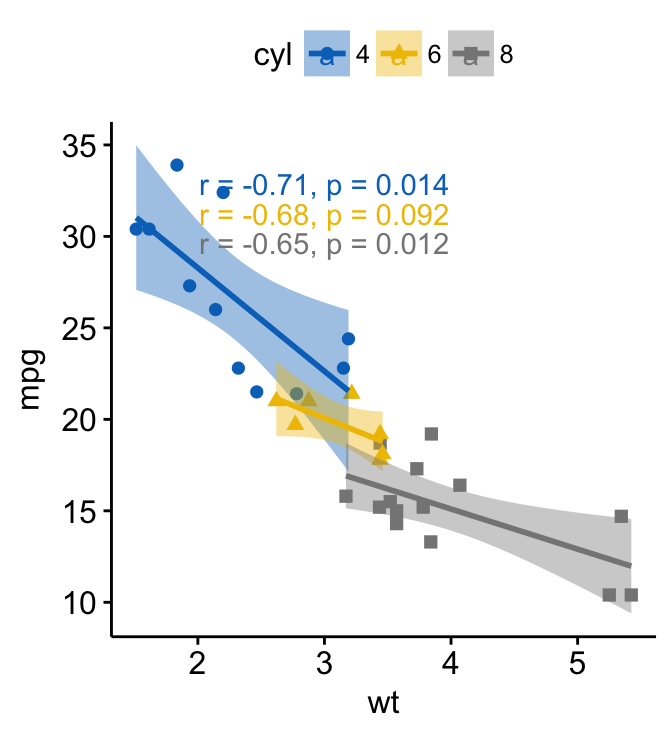 # Density plot of "Sepal.Length"
We’ll use the plots - density.p and stable.p - created in the previous section (@ref(mix-table-text-and-ggplot)). Create separately the box plot of x and y variables with transparent background. 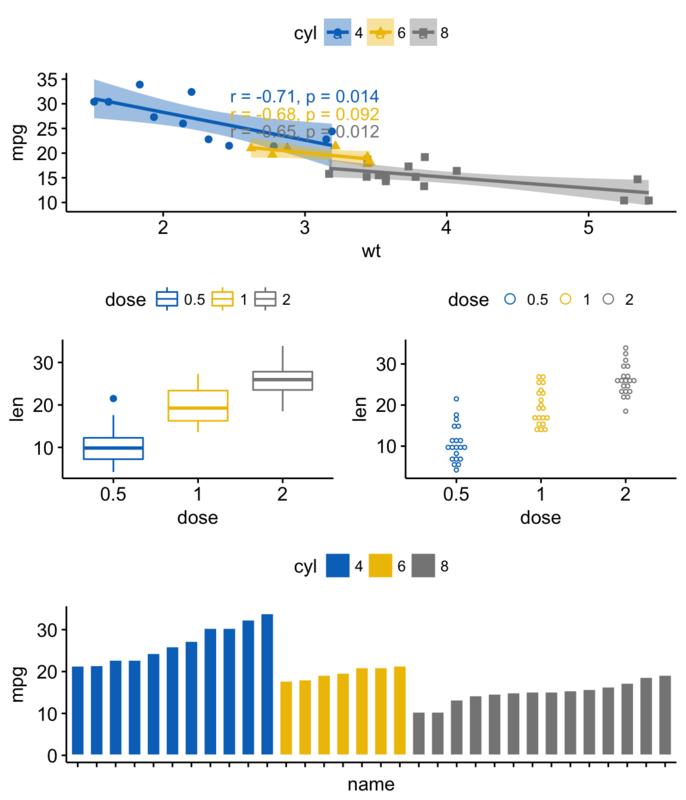 R function: ggboxplot() [ggpubr]. 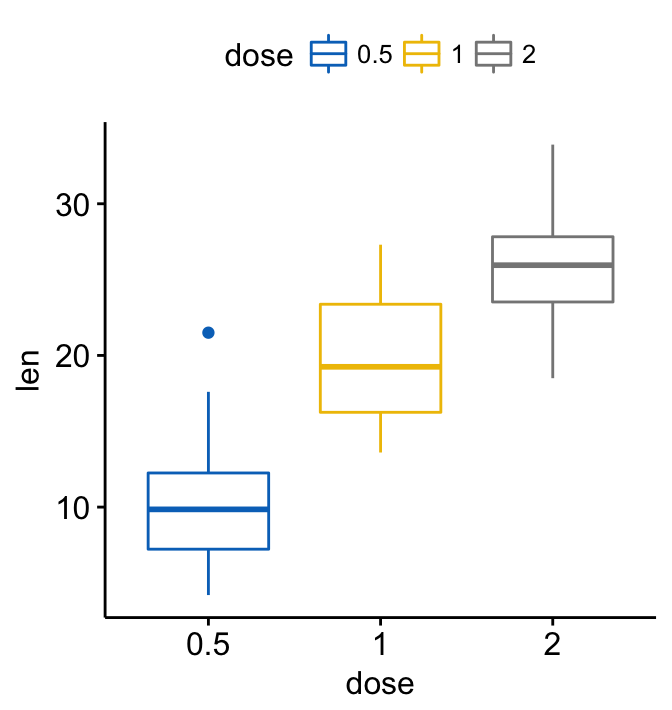 Transform the box plots into graphical objects called a “grop” in Grid terminology. R function ggplotGrob() [ggplot2]. Place the box plot grobs inside the scatter plot. R function: annotation_custom() [ggplot2]. Import the background image. Use either the function readJPEG() [in jpeg package] or the function readPNG() [in png package] depending on the format of the background image. To test the example below, make sure that the png package is installed. You can install it using install.packages(“png”) R command. Combine a ggplot with the background image. R function: background_image() [in ggpubr]. 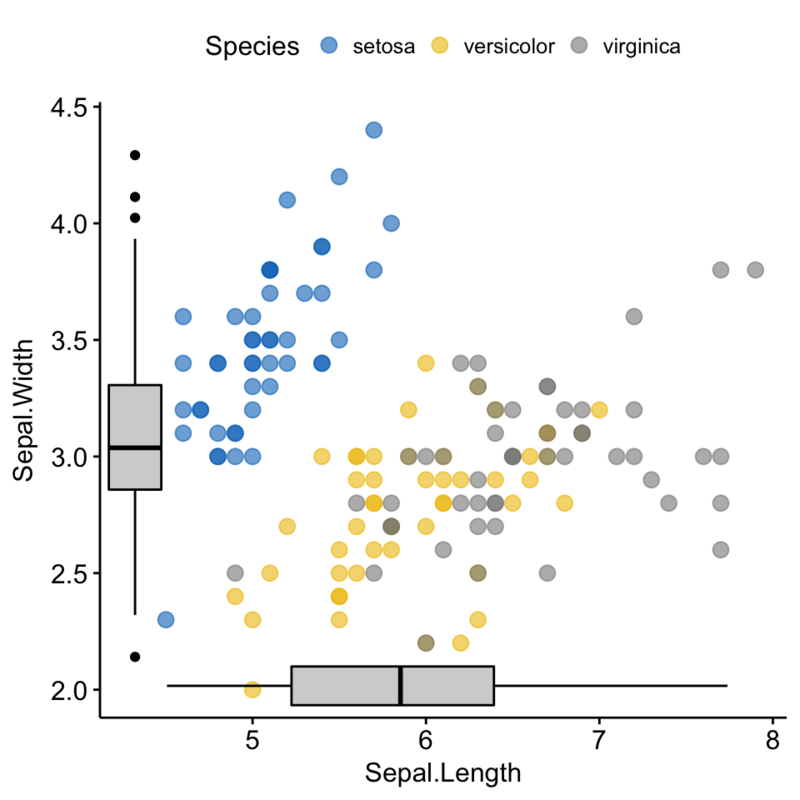 Change box plot fill color transparency by specifying the argument alpha. Value should be in [0, 1], where 0 is full transparency and 1 is no transparency. 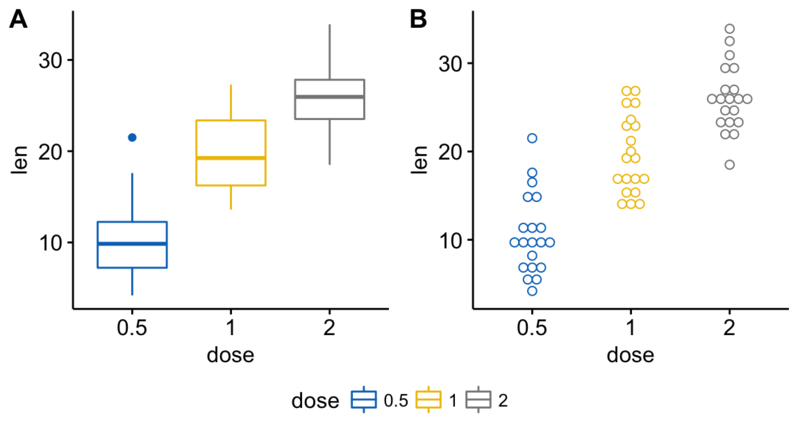 If you have a long list of ggplots, say n = 20 plots, you may want to arrange the plots and to place them on multiple pages. With 4 plots per page, you need 5 pages to hold the 20 plots. The function ggarrange() [in ggpubr] provides a convenient solution to arrange multiple ggplots over multiple pages. 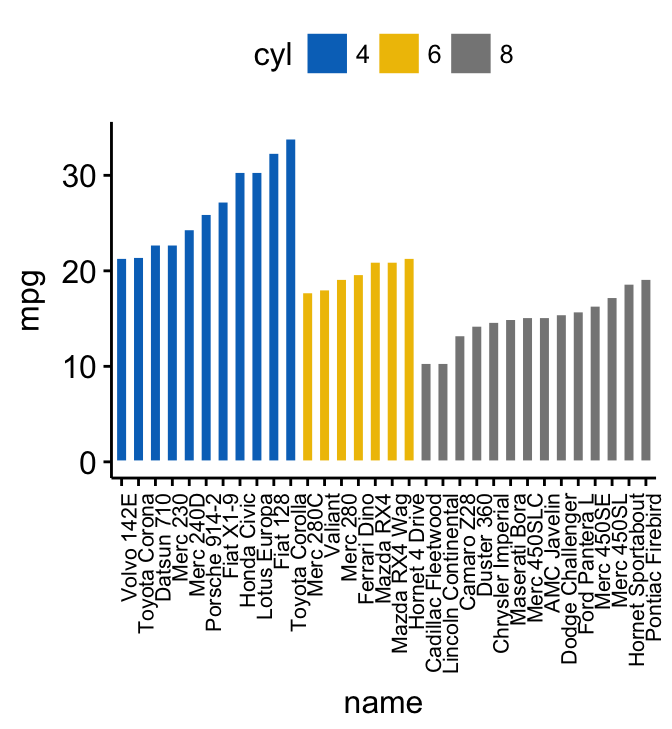 After specifying the arguments nrow and ncol, the function ggarrange() computes automatically the number of pages required to hold the list of the plots. It returns a list of arranged ggplots. Note that, it’s also possible to use the function marrangeGrob() [in gridExtra] to create a multi-pages output. 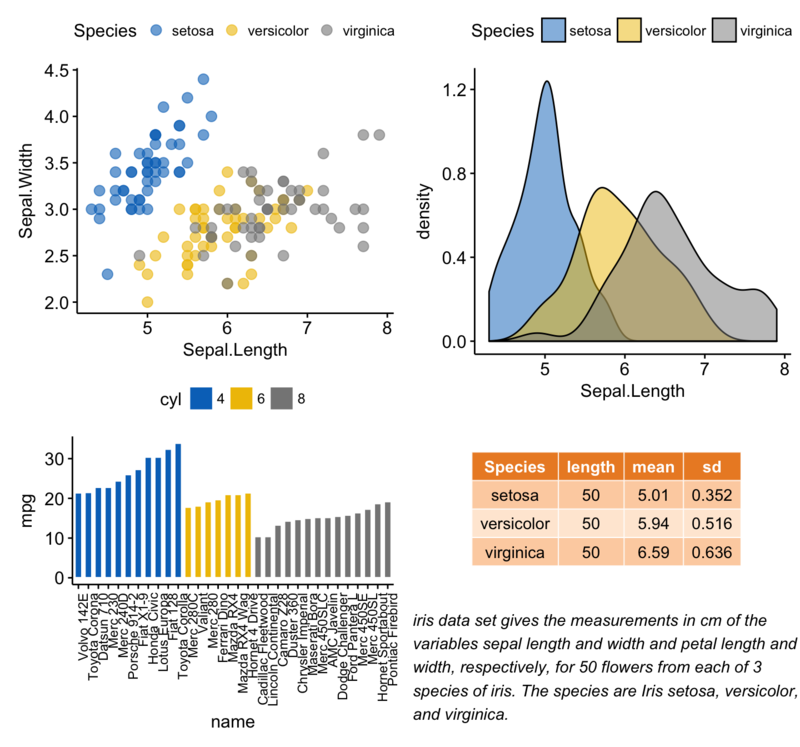 We’ll arrange the plot created in section (@ref(mix-table-text-and-ggplot)) and (@ref(create-some-plots)). R function: ggexport() [in ggpubr]. 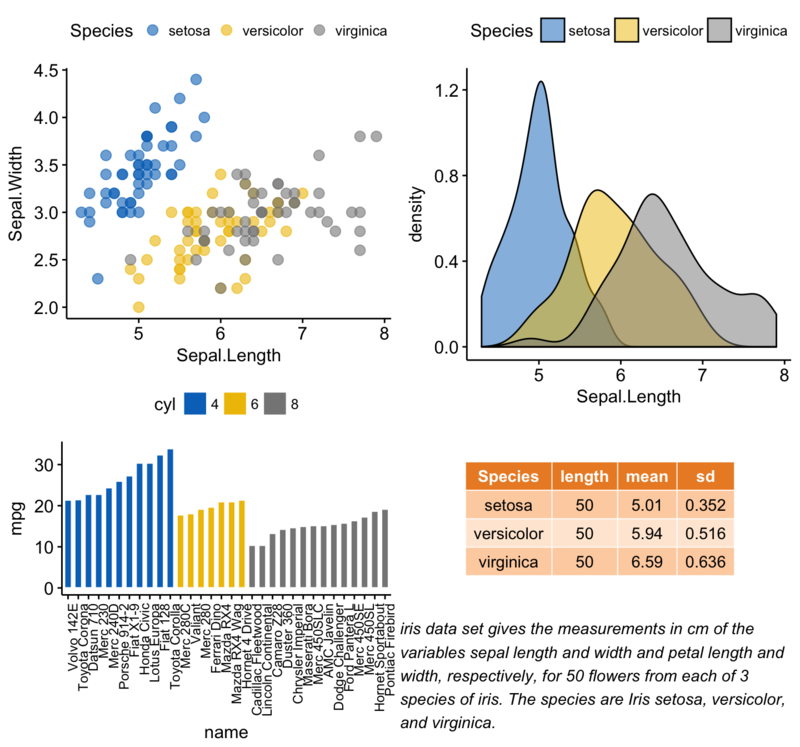 First, create a list of 4 ggplots corresponding to the variables Sepal.Length, Sepal.Width, Petal.Length and Petal.Width in the iris data set. 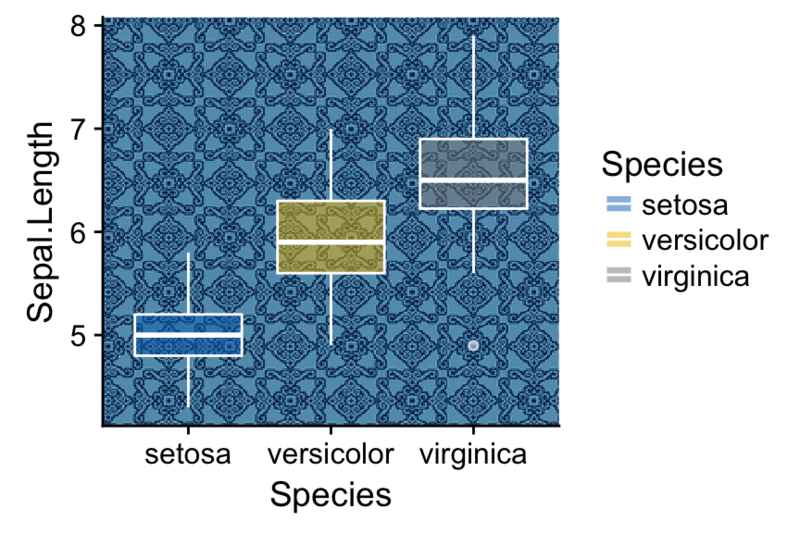 color = "Species", palette = "jco"
Next, you can export individual plots to a file (pdf, eps or png) (one plot per page). It’s also possible to arrange the plots (2 plot per page) when exporting them. Very nice. 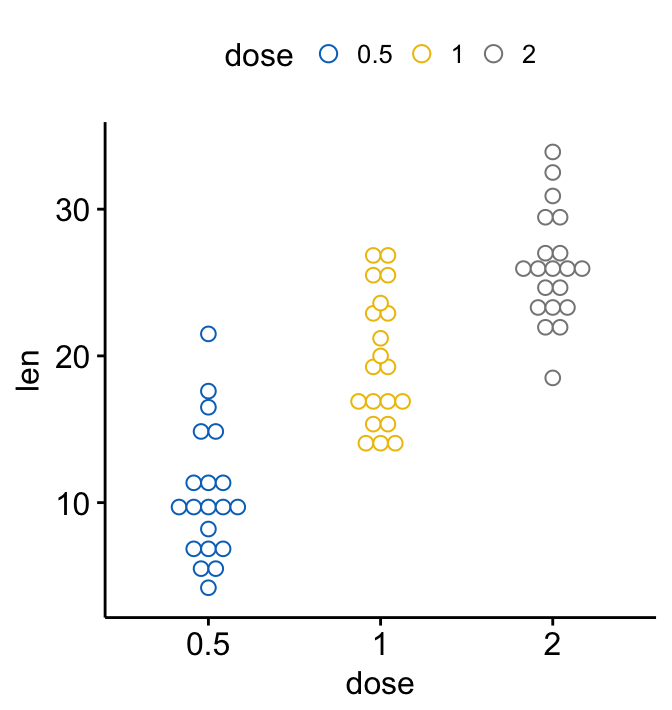 Just a comment on the scatter plot with the inserted box plots: the box plots are not placed correctly. Both are closer to the origin than they should be. How did this happen and how can it be corrected? Nice walk through. 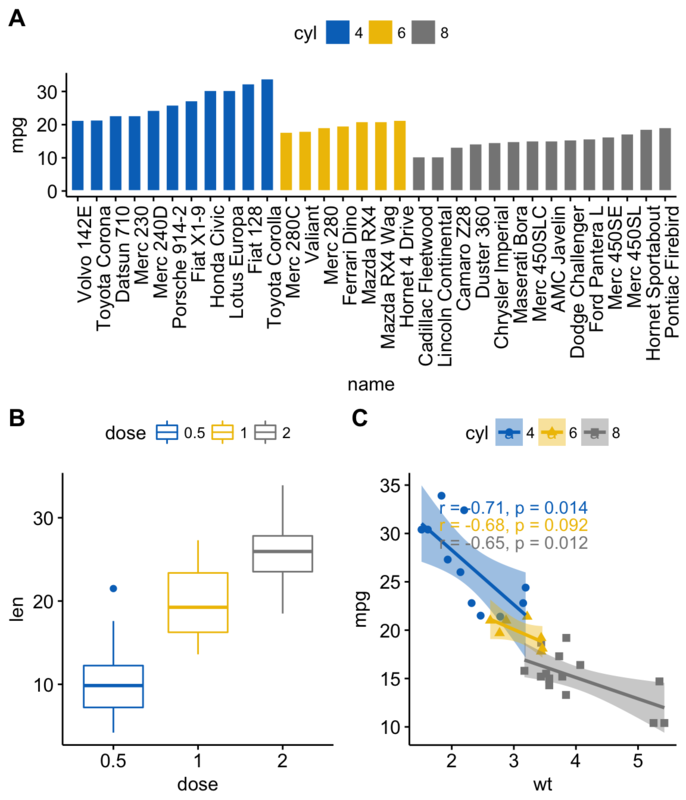 Is there any way to change the size of a table inserted into a ggplot? I have a ggplot with a geom_col and I want to insert a table in the upper right corner, but the table is huge compared to the plot and I can't figure out how to reduce its size. This package is really cool and practical! It would be nice to be able to read the article but the page keeps scrolling to the google ad making it impossible.... (using Chrome on Mac OS X).